It is widely believed that senior citizens are prized and coveted targets of violent predators. Robbers, rapists, and home invaders frequently select them for victimization because they are older, less mobile, and are less likely to be able to mount a successful defense. 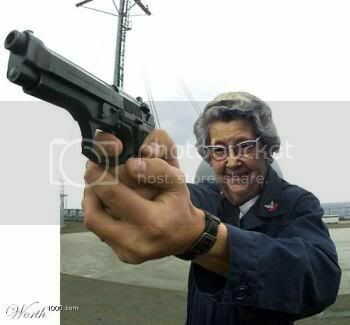 However, recent reports in the media have shown that there are senior citizens in our community who are quite capable and willing to use firearms as equalizers to be safe. Yesterday, it was reported in the Detroit Free Press Newspaper that an unidentified 88 year-old man with a Concealed Pistol License (CPL) successfully mounted a defense against an armed assailant. The attack happened during broad daylight at a local Detroit animal cruelty shelter. The bad guy was killed and no other injuries were reported. Earlier this month, a 70 year-old woman Detroit surprised two men who invaded her west-side home. She fired her firearm multiple times at the invaders who compromised a window. It was not known whether any of the predators were injured. The homeowner did not suffer any injuries. In August of this year, it was reported in the local media that an unidentified retired cop with a CPL exchanged gunfire with an armed assailant during a brazen day-time robbery of of a west-side McDonald's restaurant in Detroit. The bad guy was killed and no other injuries were reported. In June of this year, it was reported in the local media that an 81 year-old man with a CPL defended himself with a handgun against a carjacking attempt during broad daylight at a post office in Detroit. It was not certain at the time whether the bad guy was struck but the armed senior was injured in the assault and was expected to recover. These aforementioned stories are important and significant because they dispel false rumors, widely circulated in the law enforcement community, that ordinary (i.e. non-cops) armed citizens can't repel attacks from violent criminals. Furthermore, they destroy the perception that senior citizens are helpless and are incapable of defending themselves. The truth is abundantly clear - firearms are a great equalizer for citizens to utilize against threats. The aforementioned stories clearly illustrate how the elderly can defend themselves against the young, how the single citizen can defend himself against multiple attackers, and how non-cops can effectively stop predators. Moreover, these stories also have an important message for Detroit residents who aren't senior citizens: If our older residents can safely and effectively use a firearm for self-defense, then so can you. If you wish to exercise more involvement in your personal safety, the very first step you need to take is to believe that it is possible. Sometimes, all it takes to believe that you are capable of some specific task - like personal protection - is see documented evidence of others who have already done the task that you wish to perform. The aforementioned examples prove that firearm-based self-defense is possible. Hence, now you can sufficiently embolden yourself to explore options at your disposal that will enable you to be more safe from violent crime. One such option, is buying a handgun and learning how to use it. Taking a state of Michigan compliant Concealed Pistol License (CPL) is an excellent starting point. After doing so, you will have learned basic fundamental firearm safety rules, handgun handling skills, handgun buying considerations, and the laws in Michigan that address lethal force and self-defense. You have nothing to lose. Refuse to be a victim. Get trained and be safe.